The cornerstone of Centennial Plaza, the Center for Social Justice and Civil Liberties, houses the Okubo Collection and includes a gallery for visiting exhibits and an education center. Originally constructed in 1926, Tilden-Coil Constructors and LPA Inc. partnered with RCCD to renovate the building and restore its Spanish baroque façade that had been hidden for more than 50 years. Throughout the development, RCCD engaged with Old Riverside Foundation in a spirit of stewardship and respect for the historical fabric of downtown. RCCD marked its 100th anniversary with the Centennial Plaza’s dedication in March 2016. 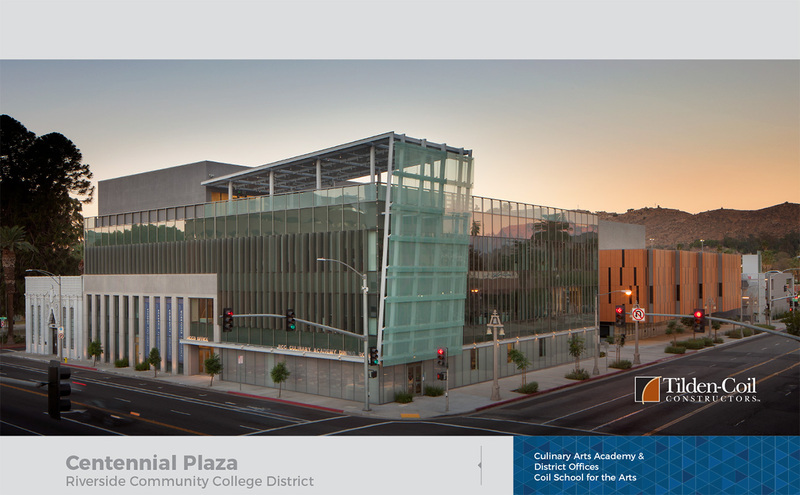 Tilden-Coil Constructors and LPA Inc. once again partnered with RCCD to develop a new 50,000 sf, four-story Riverside Community College Culinary Arts Academy and District Offices (CAADO), a two-story Coil School for the Arts (CSA), and a new 224 space, four-story parking structure—all part of the Centennial Plaza.